Do you remember my metallic blue nails that I wished were nail polish but really were just stick on nails? Well I love them so much I went search for some more of the colours. I ended up getting a gold and a silver pair from Price Attack, and while they weren't $4 like the last pair, they were on sale. For today's Metallic prompt, I chose the gold ones, and wow, I don't think I can express how shiny these things are! 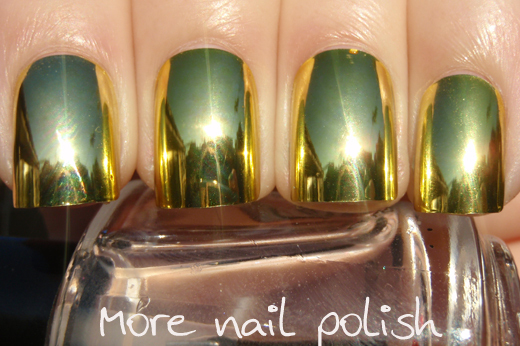 These are 1000Hour Metallic Nailz and I wore these for a whole day using the provided sticky tabs. Every nail secured perfectly and strongly except my thumbs. I had the same problem with my thumbs last time, so I guess they just aren't the right shape for these nails. Again the thing I loved about these (apart from the magnificent shine) was that all my nails were the same perfect shape and length. The other thing I discovered was that I am able to stamp on these nails and remove the design with non acetone nail polish remover and it doesn't effect the nails at all. Stamping on falsies is so great, cause if you mess up, you just wipe clean and do it again. 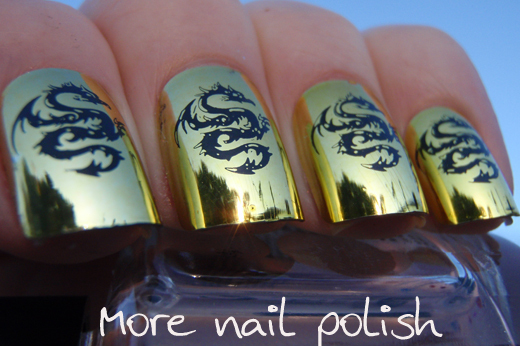 I didn't wear these with the stamped design, but I took some quick photos just as the sun was setting. Wow! 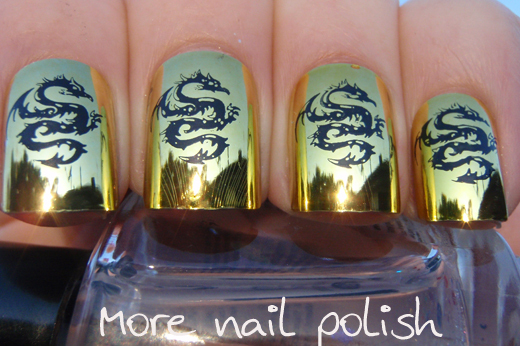 Haha, I wish these were nail polish too - how awesome would that be?! They look great, I love the idea of stamping them too - very cool! These are really cool!! The dragons look great in the sunset! Oh wow, I LOVE this look. I am totally going to try to get my hands on some of these. Holy cow! These are freaking awesome! I don't think you can get any more metallic than this! 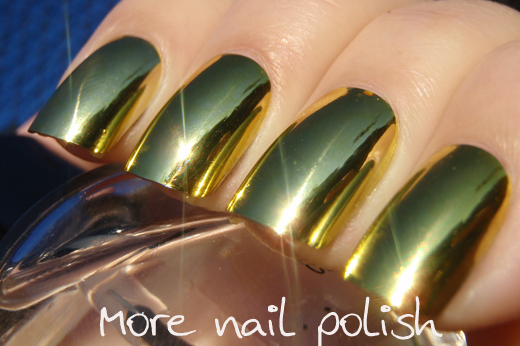 Definitely metallic!!!! These look so cool! You hit the Metallic prompt outta the park... These are amazing. Don't they kill your nails when you take off the press on /glue down nails like these? i did them once and swore never again! But I surely love how cool these look! They look so cool, what is the name of the brand? 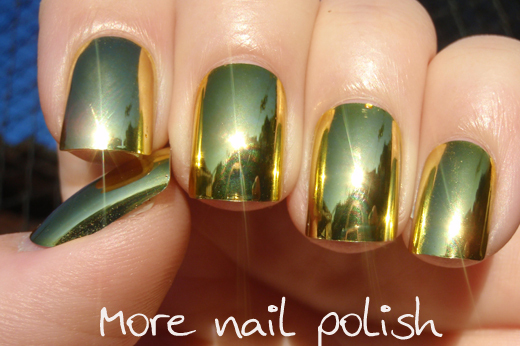 Now this is what you call metallic nails!! Wow, I love them with the stamp! That was a great touch with the sunset! 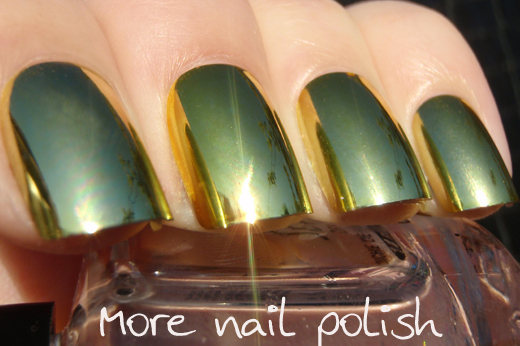 These are so pretty, I wish there was a truly metallic polish that looked like this!